​This simulator allows you to quickly check how changing the bar lengths of Klann's Mechanical Spider mechanism affect its foot-path, but remember, just because something looks good in a simulation doesn't necessarily mean it will work well when built - at least not without some tinkering. Below is the embedded simulator. You can also run the simulator on MIT's site where you can modify the Scratch code. A description of the algorithms used in this Klann linkage calculator is here. ​After changing a bar's length, click somewhere other than a slider bar and then press the space bar to see the new linkage and foot-path, and use your keyboard's left/right arrows to rotate the crank. Note: the "HiFrame" and "LowFrame" variables are the distances from the frame connections to the center of the crank. If you want to more finely tune Klann's bar lengths by 1/10th increments see the "10x" simulator further down. When building a simulated linkage in LEGO, remember to use beams with one more hole than the bar's length. For example, a bar of length 8 requires a LEGO beam with 9 holes, because when determining the length of LEGO beams, the first hole is always counted as zero. The following options resulted from playing with the simulator as opposed to running some optimization code, so there are likely better LEGO configurations of the Klann linkage waiting to be found. 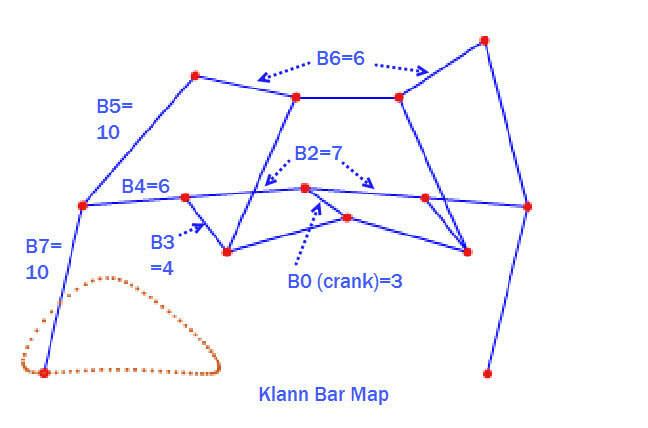 ​First, here's Klann's standard version from his patent with Klann's linkage measurements scaled so that the crank's length equals 3, alongside the LEGO version 2 approximation. Note: in the simulator you can choose the linkage from Klann's patent by pressing "k", followed by the space bar. ​Below are the foot-paths of both versions, as well as the speed of the feet when in contact with the ground. Notice how Klann's horizontal foot-speed slows at both corners of the foot-path. The feet slow down when they first contact the ground, as well as when they lift, which causes Klann to come to a stop with each step. Perhaps Klann's speed and efficiency could be improved with the addition of some sort of foot that reduced these speed differences? 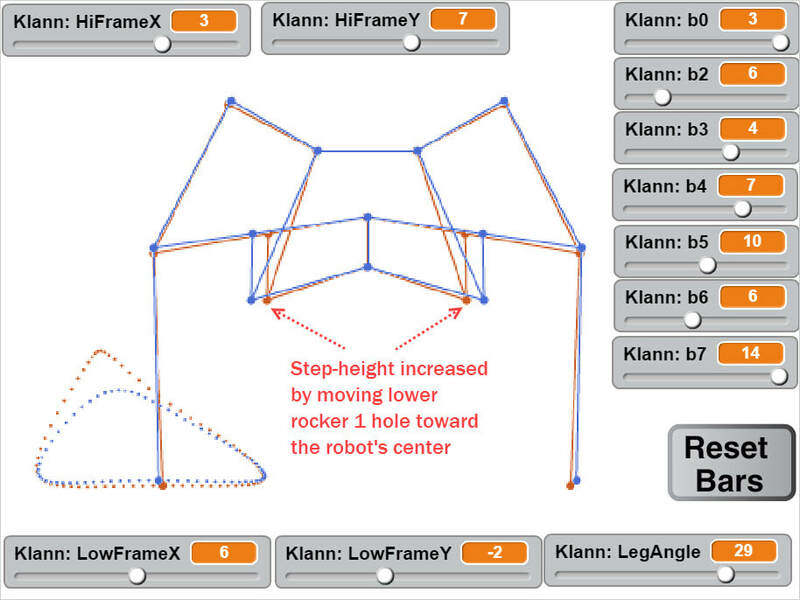 As can be seen in the following simulations of Klann and other mech's walking across the screen, Klann's feet skid when the robot is moved at a constant speed. If the robot were instead moved at the speed of the feet, then it would have a halting gait like that of the LEGO prototype further down. 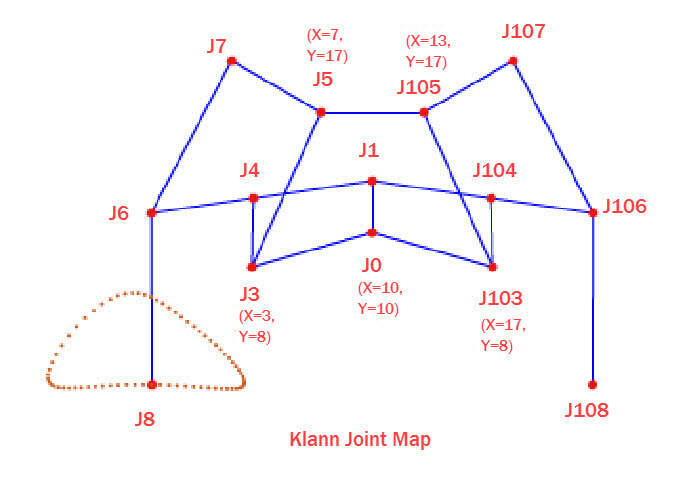 ​Directions for making this modification to Klann Ver 3 can be found here. Below are two LEGO approximations of one of Klann's high-step configurations. If you consider building either in LEGO, you may want to separate the front and rear legs by a 40 tooth gear so that the top leg joints don't collide. 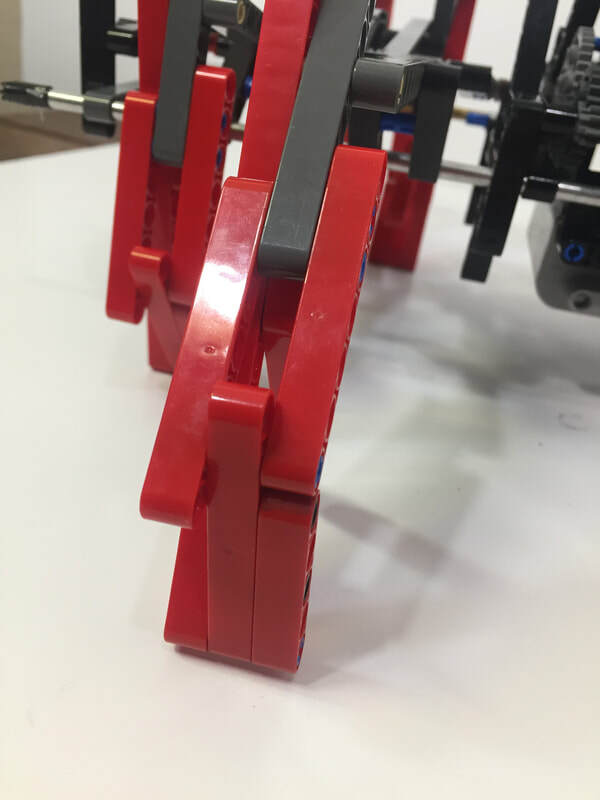 Separating the legs should also make for a more stable robot when climbing, but it will require 2 more crank/axle systems - one for the front legs, and one for the back legs. The above high-step options may tend to trip when the feet are lifted off the ground due to the sharp angle of the foot-path's lower right corner. Also, the foot looks like it will reverse direction and drag a bit while still on the ground, so it may not work that well if the feet don't slide or rotate. Below is another higher-step option, with a more rounded foot-path. The short leg version has B7=10 like Klann ver 2, and the long leg version has B7=14. Note: long-leg Mindstorms versions may not turn that well on non-smooth surfaces due to the leverage of the longer legs plus the weight of the EV3 brick - the legs would bend sideways, and maybe by a lot. You can see an example of this in the video of Klann's Spider - Mindstorms Long Legs. 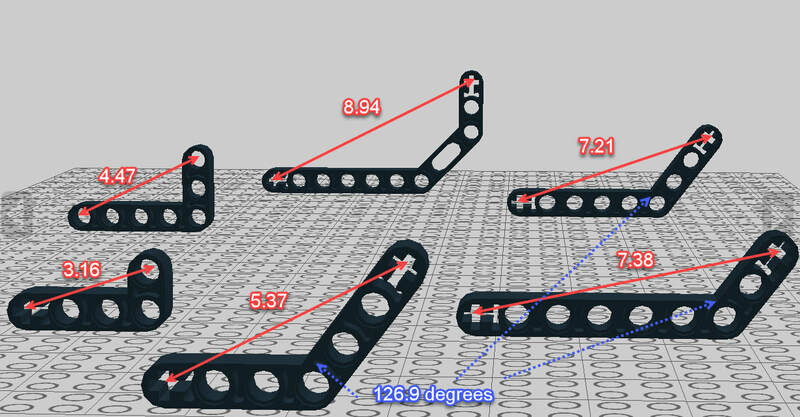 There are likely many more LEGO-friendly versions that can be found with the simulator, especially if LEGO's bent bars are included in the search (lengths shown below). ​Here are a few ideas for making a 29 degree knee bend that the above options have. Below is a 2X version of the 4-4-7 triangle for making a longer version of Klann's legs (B7=14), and an example of implementing it in LEGO to the right. Note that a 15 hole beam is required for a leg section of length 14, because when determining the length of LEGO beams, the first hole is always counted as zero. Here the the instructions for building Klann with these longer legs. 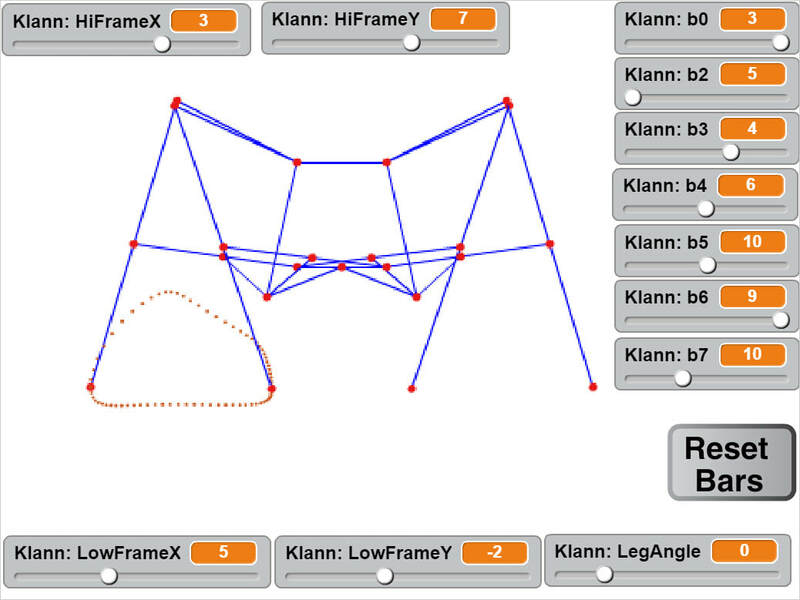 ​UPDATE: MIT released Scratch 3.0 on Jan 1, 2019, which currently doesn't allow variables to be set above 100 with the slider bar, nor decimals, meaning the above odd-length bars have to be put in the simulator's code on MIT's site - for now at least. ​After changing a bar's length, click somewhere other than a slider bar and then press the space bar to see the new linkage and foot-path, and use your keyboard's left/right arrows to rotate the crank. Below are a few more possibilities. Notice the leg angles. 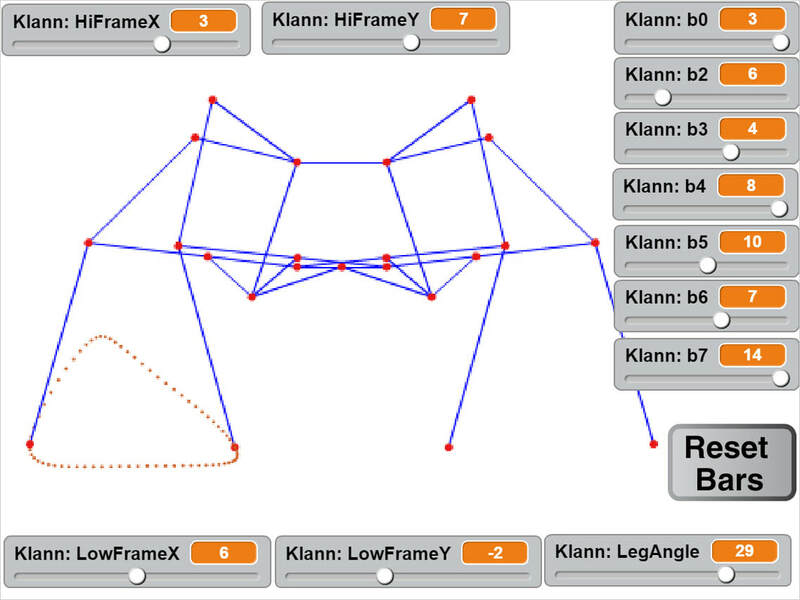 A description of the algorithms, and how we used them to calculate Klann's linkage, is here.